A combination of two techniques promises to improve the efficiency and effectiveness of experimental gene therapies, while also reducing potential side effects, says a new research report published in the December 2011 issue of the FASEB Journal. The report describes how scientists from Germany combined two techniques involving the use of site-specific recombinases, or enzymes that facilitate the exchange of genetic material between DNA strands, to help guide exactly where new genetic material is inserted into a cell's DNA. This experimental approach to gene therapy represents an important advance, as successful gene therapy has the potential to correct the root cause of numerous illnesses and health conditions. "The central outcome of these and related techniques is the predictability and safety of a therapeutic regimen," said Dr. Juergen Bode, a researcher involved in the work from the Institute of Experimental Hematology at Hanover Medical School in Hanover, Germany. "These novel strategies will obviate the majority of animal experiments that are presently needed; it will enhance the effectiveness and shorten the timeline." To make this discovery, Bode and colleagues identified two types of site-specific recombinases (SSR), one from yeast (Flp recombinase) and one from phages (PhiC31 recombinase), which are capable of tagging and targeting specific areas in a DNA strand. Specifically, the tagging process involves mounting a distinct address within a genome, whereas the targeting process covers the delivery of genetic material to this address. PhiC31was identified as an ideal enzyme for tagging because it recognizes just a limited number of pre-existent genomic addresses with well-known and mostly beneficial characteristics, allows for only a one-way transfer of genetic material, and is basically irreversible. A new research report appearing in the December 2011 issue of the FASEB Journal shows how scientists from the United Kingdom have developed a simple blood test to detect Parkinson's disease even at the earliest stages. The test is possible because scientists found a substance in the blood, called "phosphorylated alpha-synuclein," which is common in people with Parkinson's disease, and then developed a way to identify its presence in blood. "A blood test for Parkinson's disease would mean you could find out if a person was in danger of getting the disease, before the symptoms started," said Dr. David Allsop, a researcher involved in the work from the Division of Biomedical and Life Sciences and the School of Health and Medicine at the University of Lancaster, in Lancaster, UK. "This would help the development of medicines that could protect the brain, which would be better for the quality of life and future health of older people." To develop the blood test for Parkinson's disease, Dr. Allsop and colleagues studied a group of people diagnosed with the disease and a second group of healthy people of a similar age. Blood samples from each group were analyzed to determine the levels of phosphorylated alpha-synuclein present. They found those with Parkinson's disease had increased levels of the substance. Based upon these findings, researchers developed a blood test that detects the presence of phosphorylated alpha-synuclein, which could allow for diagnosis of the disease well before symptoms appear, but when brain damage has already begun to occur. "When most people think of Parkinson's disease, they think of the outward symptoms, such as involuntary movements," said Dr. Most of the time, Dr. Stefano Torriani is a plant pathologist. His most recent research project revolved around the fungus Mycosphaerella graminicola where he analyzed a special class of genes that encode cell-wall-degrading enzymes. A virulent fungus relies heavily on these enzymes when attacking a plant. But while investigating these genes, Dr. Torriani came across something odd; one gene came in different sizes in different individuals. To further explore and better understand this phenomenon, the researcher deviated from his original plan and drew in other experts, including Drs. Daniel Croll, Patrick Brunner, and Eva Stukenbrock from the research group led by Dr. Bruce McDonald, Professor of Plant Pathology, ETH Zurich. What the collaborators discovered after a year of feverish research throws new light on genome evolution - but still leaves many questions unanswered. The plant pathologists quickly answered the question of why the same gene came in different lengths in different individuals. In some strains, the gene "ID-60105," which encodes for a cell-wall-digesting enzyme, had an intron; in other strains, the same gene did not have an intron. Thus, the researchers stepped into a relatively young field in biology. So-called "spliceosomal introns" were discovered only 30 years ago. Because they are non-coding regions of a gene, they provide no information on the structure of the encoded protein. Introns are separated by the coding regions, called exons. A gene, including both exons and introns, is read by the cellular machinery and transcribed into a messenger RNA. In a next step, the noncoding introns are cut away and the coding exons are spliced together. This creates the blueprint for the corresponding protein encoded by a gene. Scientists have long held theories about the importance of proteins called B-type lamins in the process of embryonic stem cells replicating and differentiating into different varieties of cells. New research from a multi-institutional team led by the Carnegie Institution for Science’s Dr. Yixian Zheng indicates that, counter to expectations, these B-type lamins are not necessary for stem cells to renew and develop, but are necessary for proper organ development. The team’s work was published on November 24, 2011 in Science Express. Nuclear lamina is the material that lines the inside of a cell's nucleus. Its major structural component is a family of proteins called lamins, of which B-type lamins are prominent members and thought to be absolutely essential for a cell's survival. Mutations in lamins have been linked to a number of human diseases. Lamins are thought to suppress the expression of certain genes by binding directly to the DNA within the cell's nucleus. The role of B-type lamins in the differentiation of embryonic stem cells into various types of cells, depending on where in a body they are located, was thought to be crucial. The lamins were thought to use their DNA-binding suppression abilities to tell a cell which type of development pathway to follow. But the research team--including Carnegie's Drs. Youngjo Kim, Katie McDole, and Chen-Ming Fan--took a hard look at the functions of B-type lamins in embryonic stem cells and in live mice. They found that, counter to expectations, B-type lamins were not essential for embryonic stem cells to survive, nor did their DNA binding directly regulate the genes to which they were attached. However, mice deficient in B-type lamins were born with improperly developed organs—including defects in the lungs, diaphragms, and brains—and were unable to breathe. 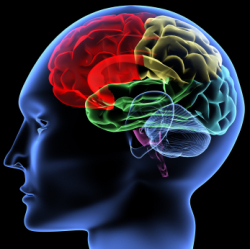 Huntington's disease (HD) is characterized by ongoing destruction of specific neurons within the brain. It affects a person's ability to walk, talk, and think - leading to involuntary movement and loss of muscle coordination. New research, published on November 25, 2011 in BioMed Central's open access journal Molecular Neurodegeneration, shows that the RyanR inhibitor Dantrolene is able to reduce the severity of walking and balance problems in a mouse model of HD. Progressive damage to medium spiny neurons (MSN) in the brain of a person with HD is responsible for many of the symptoms and is caused by an inherited recessive mutation in the gene 'Huntingtin.’ The mutated version of this protein leads to abnormal release of calcium from stores within the neurons which in turn disrupts the connections between neurons firing and muscle contractions, and eventually kills the neurons. Researchers from the University of Texas Southwestern Medical Center, and colleagues, tested Dantrolene, a muscle relaxant which works by stabilizing calcium signaling, and showed that this drug could prevent calcium-dependent toxicity in laboratory-grown neurons. The team led by Dr. Ilya Bezprozvanny also found that Dantrolene could prevent destruction of coordination, measured by beam walking and footprint patterns, in mice with Huntington's-like disease. Dr. Bezprozvanny explained, "One of the features of HD mice is the progressive loss of their NeuN-positive neurons. Dantrolene was not only able to protect muscle coordination in mice with HD, but also prevented destruction of NeuN-positive neurons. Each fall millions of monarch butterflies from across the eastern United States use a time-compensated sun compass to direct their navigation south, traveling up to 2,000 miles to an overwintering site in a specific grove of fir trees in central Mexico. Scientists have long been fascinated by the biological mechanisms that allow successive generations of these delicate creatures to traverse such long distances to a small region roughly 300 square miles in size. To unlock the genetic and regulatory elements important for this remarkable journey, neurobiologists at the University of Massachusetts Medical School (UMMS) are the first to sequence and analyze the monarch butterfly genome. "Migratory monarchs are at least two generations removed from those that made the journey the previous fall," said Dr. Steven M. Reppert, professor and chair of neurobiology and senior author of the study. "They have never been to the overwintering sites before, and have no relatives to follow on their way. There must be a genetic program underlying the butterflies' migratory behavior. We want to know what that program is, and how it works." In a paper featured as the cover article of the November 23, 2011 issue of Cell, Dr. Reppert and UMMS colleagues Dr. Shuai Zhan, and Dr. Christine Merlin, along with collaborator Dr. Jeffrey L. Boore, CEO of Genome Project Solutions in Hercules, California, describe how next-generation sequencing technology was used to generate a draft 273 Mb genome of the migratory monarch. Analysis of the combined genetic assembly revealed an estimated set of 16,866 protein-coding genes, comprising several gene families likely involved in major aspects of the monarch's seasonal migration. The novel insights gained by Dr. Researchers have discovered a group of chemical compounds that might one day be developed into drugs that can treat malaria infection in both the liver and the bloodstream. The study, which was published online on November 17, 2011 in Science, was led by Elizabeth A. Winzeler, Ph.D., of the Scripps Research Institute in La Jolla, California, and was partially funded by the National Institute of Allergy and Infectious Diseases (NIAID), part of the National Institutes of Health. Caused by four related parasites in the genus Plasmodium, malaria is transmitted to humans via the bite of an infected mosquito. Once the bite occurs, the parasites travel to the liver, where they usually multiply rapidly for about a week without causing symptoms. Symptoms begin when the parasites spread from the liver to the rest of the body through the bloodstream. However, the parasites can lie dormant in the liver for periods ranging from several months to years before an infected person demonstrates symptoms. Most of the malaria drugs currently in development target the symptomatic, blood stage of infection. To help achieve malaria eradication, however, a drug would ideally treat infection during both the liver and blood stages. Currently, the World Health Organization recommends only one treatment, primaquine, for the initial, liver stage of certain types of malaria infection; however, primaquine and related drugs can cause a dangerous blood disorder among patients with a genetic condition that is common in malaria-endemic regions of the world. Additionally, drug resistance has been reported, which amplifies the need to find new treatment alternatives. Collaborative research from Perelman School of Medicine at the University of Pennsylvania has shown that psoriasis patients have an increased risk of heart attack, stroke, and cardiovascular death, especially if the psoriasis is moderate to severe. Now, Penn researchers have discovered the potential underlying mechanism by which the inflammatory skin disease impacts cardiovascular health. In two new studies presented at the 2011 American Heart Association Scientific Sessions (November 12-16, 2011) in Orlando, Florida, Penn researchers show that the systemic inflammatory impact of psoriasis may alter both the makeup and numbers of cholesterol particles, as well as impair the function of high-density lipoprotein (HDL), the "good" cholesterol. "Anecdotally, many researchers have observed that HDL levels may be lower in states of inflammation, such as rheumatoid arthritis, psoriasis, and even obesity," said lead study author Dr. Nehal Mehta, director of Inflammatory Risk in Preventive Cardiology at Penn. "However, these new findings suggest that in addition to lower levels, chronic inflammation associated with conditions like psoriasis may change the composition and decrease the function of HDL as well." In the current studies, researchers enrolled 78 patients with psoriasis and 84 control subjects. In the first study, the authors measured fasting lipid levels and examined the number and size of cholesterol particles using nuclear magnetic resonance (NMR) spectroscopy. This analysis revealed that patients with psoriasis had a higher number of smaller LDL particles, or "bad" cholesterol, which was independent of traditional risk factors and obesity. Researchers and conservationists from the Wildlife Conservation Society's Guatemala Program, WCS's Bronx Zoo, the National Park Service of Guatemala, and other groups report a major conservation victory from Central America: a bumper crop of magnificent scarlet macaw fledglings that have now taken flight over the forests of Guatemala. The newly fledged birds total 29 macaws, a big success for conservationists working in the Maya Biosphere Reserve who were hoping to record at least one fledgling from each monitored nest (24 nests in total) during the 2011 season. The monitoring program focused on helping weak and at-risk chicks—some of which were removed from tree cavity nests and hand-reared in a jungle hospital—with guidance from the Bronx Zoo's Department of Ornithology and veterinarians from the Global Health Program. The rehabilitated chicks were then fostered back in nests with chicks of the same age, a procedure that greatly increased the chances of survival for these rare birds. "The success in increasing the nesting success of scarlet macaws through intensive chick management and fostering is a great step forward for macaw conservation," said WCS Conservationist Rony Garcia. "We believe the lessons learned can not only help save the scarlet macaw in Guatemala, but be extended to help other threatened species of parrots and cavity nesters across the globe." 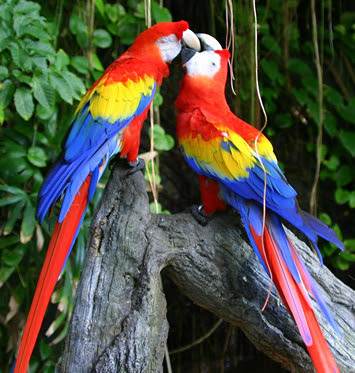 With a total estimated population of some 300 macaws in the country, each successfully fledged bird is critical for the survival of the species. The bumper crop of fledglings in the 2011 season stands in stark contrast to the 2003 season that registered only one fledgling from 15 nests. Monitoring scarlet macaw nests is not for the faint of heart.